Bangladesh, official name “The People’s Republic of Bangladesh” is situated in southern Asia, on the Indian subcontinent. The area of country is 147,570 square kilometers (56,977 square miles). The administration of Bangladesh is divided into seven major regions called divisions (Dhaka, Chittagong, Khulna, Barisal, Rajshai, Sylhet and Rangpur. The divisions of Bangladesh are divided into 64 districts, or zila. Districts are further subdivided into 493 upazila or sub-districts. 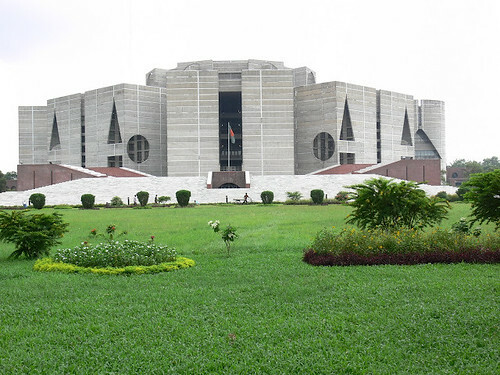 Dhaka the capital city of Bangladesh is located in the central part of the country. Bengali is the national language is spoken by 95% of the population, however English is widely understood. About 90% of the population is Islamic, the rest of the population comprised of Hindu, Buddhist, and Christian minorities. The people of Bangladesh are very simple, friendly and hospitable. Sound communal harmony with the different religions in Bangladesh has ensured a very congenial atmosphere. More than 75% of the population live in rural areas. However, Urbanization has been rapid in the last few years. Bangladesh has an agrarian economy. Yet it dominates the economy accommodating major rural labour force. PRINCIPAL EXPORTS: Agricultural products, Ready-made garments, Knitwear, Jute and Jute goods, Shrimps, Leather and Leather goods, Pharmaceuticals, Tea, Handicrafts, Ceramic, Light Engineering Products, etc. PRINCIPAL IMPORTS: Chemicals, Cement, Petroleum & Lubricants, Capital Machinery, Machinery parts, Tinned and Bagged Milk powder, Edible oil, Automobiles, electronics etc. PRINCIPAL MINERAL: Natural gas,oil, Coal, white clay, glass sand etc.